So I'm a little bit late with my 'Spring Cleaning' process since it's already almost half way through June. Whoops. However, the entire purpose of Spring cleaning a wardrobe sort out is to decide what you actually wear and to determine whats missing from your collection. Right now I'm just in the midst of purchasing some pieces for my Holiday to Tenerife next month, and with one glace at my currently existing closet I can safely say it's going to become a complete overhaul! 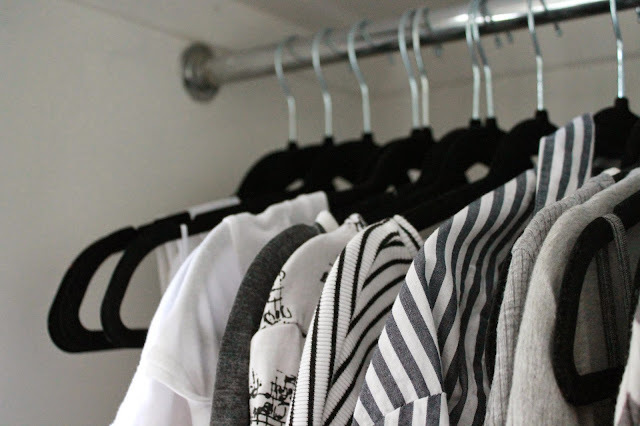 Today I'm going to share with you my top tips & tricks for whittling down your wardrobe. I remember when I was a child my Mum would often buy clothing from the next size range up insisting that eventually we would 'grow into them'. Now that I'm older it's obvious that this was usually a money saving scheme although in the end there was quite an abundance of clothes that were never worn because they had been forgotten about. So why is it as adults we continue to keep pieces that don't fit just yet? I think it's great to have personal goals to slim down enough to reap the rewards of finally fitting into that pair of shorts, so long as that isn't half of your wardrobe. I'd say have a maximum of 2/3 pieces which you will realistically be able to fit in. Otherwise surely it's best to free up some space for new pieces that you know you can rock! 02. When was the last time you wore it? I'll put my hands up and say I'm definitely guilty of this one. I have too many items that I try to convince myself I'll wear this year, only to not even give them so much as a thought when it comes to choosing my outfit for the day. Next time you're having a sort out, consider the last time you actually wore the piece. If it was over 2 years ago then chances are that it's not going to make a reappearance and isn't a piece that you have much desire to wear. If you haven't worn it for a while it's best to cut your losses and get rid. I'm positive you'll be able to fill that gap with something much more you in no time! 03. Is it still in keeping with your personal style? I can guarantee that we've all had that one item of clothing that has been in and out of the 'get rid of' pile more times than the Peter Andre on reality TV. What is it that makes you keep going back to it? More often than not there isn't a real reason other than 'I just like it'. I'm not suggesting that just because something is a little bit different from your usual style that it should be completely outcast, since it's always fun to experiment with cuts and fits. Sometimes we need a little kick up the bum to let go of nostalgic pieces that perhaps don't reflect you and the way you like to dress anymore. Once you've adiosed it chances are you won't even realise it's gone. 04. Tidy Wardrobe, Tidy Mind. It's true what they say about the cleanliness of your closet being linked with you general peace of mind. One of my mama's favourite sayings is 'You can't see the wood for the trees' (let me know if this is a generally well known saying). It basically means if your overcrowded with stuff you won't be able to take in the whole picture. Applying this quote to your wardrobe is a key way of sorting what you want. If your closet is cluttered then your mind may be too preoccupied trying to scan through mountains of clothing to actually create an outfit that you're happy with. Ending in an okayish look and a frustrated and flustered fashionista. This is why it is so important to decide what you really need in your wardrobe and what it's time to say farewell to. Trust me your brain will love you for it. So there we have it, My top tips for sorting your wardrobe! Do let me know if this is helpful to any of you - I'd love some feedback. If you did like this post then why not check out my 5 things to consider before buying ?